How often do you attentively listen to music, free from distraction, absorbing what it has to offer? As a student or beyond, your musical “to-do” list can fill up quickly. 1. It develops your overall musicianship, and if you play what you transcribe, it also helps you gain proficiency on your instrument. Most conservatories have some sort of required coursework containing “ear training” or “dictation” where a student must write down a melody or harmony played by a teacher. Transcribing will give you an advantage in these courses, and may even enable you to test out of them. 2. Transcribing can be a source of income. 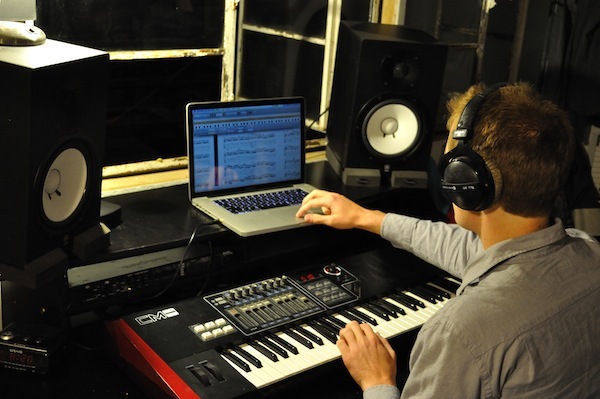 From composers to music publishers to academic institutions, there is often demand for individuals with the patience and skill to do transcriptions. Arrangers who need an original recording notated but are too busy to do it themselves. In many cases transcribing can also make you more attractive as a private teacher, since you can write out the music to anything the student may want to study. 3. Most importantly, transcribing gives you a deeper understanding of the music you like, allowing you to better develop and articulate your own musical identity. To a certain extent, this can be accomplished by listening without writing anything down. However, the process of writing things out will help focus your ears and force you to think about how the music fits together. This is a vital part of your musical development, whether you’re a composer, a singer/songwriter, a jazz musician, a performer in classical ensembles, or all of the above. It is easy to get caught up in endless practicing, rehearsing, studying, and performing. Take some time to really soak up and understand the music that matters to you. If you haven’t done much transcribing, it can seem daunting, particularly if you’re still developing your knowledge of theory and your ability to read music. At first, the key is to find music that is not too difficult. Try taking a melody you know by heart (it doesn’t matter what genre or style) and can easily sing. Write down the melody. Or, if you want to make it even easier, write out a rhythmic pattern or drum part to a song you like. Don’t worry too much about accuracy. It’s much more important to develop your ears and move through the whole selection than to spend a lot of time picking over the details of a single passage. From here, you simply transcribe things of increasing difficulty and complexity. While it is best to begin with the most prominent voice or instrument, eventually you will be able to transcribe accompanying parts as well. 1. Have a very clear idea of what you want to transcribe. Is it a whole piece, a solo passage, a section from a larger work, or just a few measures that interest you? Determine the length, meter, key, and instrumentation and write them down. This will allow you to create a template (either with manuscript paper or in digital notation software) that you can simply fill in with the material you transcribe. 2. When it comes to writing out the actual notes, if the passage is difficult, first focus on the rhythm. Write it down and fill in the pitches later (this is very easy to do using notation software). Keep in mind that in most genres (but particularly in jazz), portions of the music are improvised, interpreted freely, or were otherwise never notated. This means that you are trying to record and approximate something that happened spontaneously. Opt for clarity in your notation rather than literal accuracy. And be aware that it may be better to set aside something frustrating and work on an easier project until your ears have improved. Something that will cause you hours of headaches today may take you 30 minutes six months from now. Any amount of regular, attentive transcribing will help you immensely, regardless of your background. It will make you a better composer, listener, arranger, and ensemble player. Find some time in your routine ‚ even 5 or 10 minutes a day makes a difference‚ to carefully absorb and write down the music that moves you. Erik Miron received a B.A. in Music (University of Southern California, Thornton School of Music) with a minor in Philosophy in 2009. He currently composes, records and performs as a guitarist and multi-instrumentalist in the Los Angeles area. He also works frequently on music preparation projects as a copyist and editor, in addition to transcribing. You can hear samples of his writing and playing with the Vintage Modernists, and you can reach him by email at erikmironmusic@gmail.com. …that the great jazz saxophonist John Coltrane would only say he had listened to a recording after he had heard it half a dozen times or more. He would follow each individual instrument once, then go through the track again to take it in as a whole. Miles Davis also benefited from this process. Early in his career, he made part of his living by doing transcriptions. Many music schools offer courses in music notation software. Finale and Sibelius are the two most common programs; knowing them well can make the transcribing process easier. Taking courses in them can put you in touch with people you may end up working with later on. Find some like-minded individuals who like to transcribe, and get together to discuss your projects. You’ll learn a lot, stay motivated, and maybe even wind up with a job or two. While you can transcribe with any instrument, it’s often easiest to do so at the piano. A good MIDI-compatible digital keyboard can make things easier, and will be useful as an input device for notation software. There are several programs that can slow down music, modulate the pitch, or otherwise make a recording easier to transcribe. While it’s better to do things entirely by ear (and wait until your ears are developed enough to tackle a harder passage), they can help a lot when you have a deadline. Two of the most often-used programs are Transcribe! and Amazing Slow Downer. Great read here. Transcription is something I have been doing for the past 4 years. It really enhances one’s musicianship and is the topic of my capstone project as I end my graduate degree in music education. I’m curious about how one gets career opportunities in this field. Could you point me to some other resources that could help? We’ve reached out to the author of this article for more information. In the meantime, if anyone else has knowledge of career opportunities in transcription, please post. Two suggestions from the author of this article: 1. Check with your local Musician’s Union about possible work. 2. Consider studying with a composition teacher who works in film and television. Read your article and indeed it is very true. I’m a full time piano teacher and ever since I started transcribing, I find that I’ve improved in my playing as well as my listening skills. I’ve been doing transcribing since last year and I play it as a piano cover in my YouTube channel. I’m also looking for career oppotunities. I wonder whether you can recommend music schools, organization etc. where I can apply for career advancement? This article was helpful for me to get a new perspective on transcribing and it’s different uses. It also helped me see my mistake of trying to do something difficult right away. With ten years of piano lessons, I have all kinds of arrangement ideas and melodies in my head. But to put them on paper is a whole different story! Your article showed me to build my ability to write what I hear just like I built my ability to play what I read. Thanks for that article! I have a simple question: How do you know the time signature for a song I want to transcribe? I try to transcribe a song I know without looking at any other arrangement before hand. But I always get stuck on the time signature and have to than take a peek at some one’s finished project for help! Is it because I have an embarrassing amount of music theory for ten years of lessons, or is there some basic trick that I haven’t heard?!? It would be great to get some help from a professional when I run into problems like these. (As if you haven’t been helpful already!!!) Just wanted to thank you for the article and get a little tip if it’s not to much trouble. Thanks again! 1. Feel where the big beats are (heaviest stresses on beats) and assume that’s the downbeat of each bar, count out loud the number of beats in between each big beat. 2. If it’s an odd time signature, try to figure out a pattern of stresses and break it down (if it’s 7/8 time, it might be a group of 2 and two groups of 3, for example). 3. Counting out loud is very helpful. 4. Like most things, it takes practice and a lot of listening to get comfortable with and be good at transcribing. This is a well written piece, and the advice matches what I have heard from music teachers over the years. It’s nice to read from a member of the Vintage Modernists. Thanks for the article.